Did you know our fees are tax deductible? Our Fees include a professionally prepared tax return by a qualified Accountant or Tax Agent. You then have the choice to have your tax refund paid Instantly! Our fees start from a low $99.00 for online tax returns. Tax Returns prepared in our office start at $120. Where clients choose to have an Instant Tax Refund (in advance of the ATO refund), there is an additional fee of 7.7% (8.8% in QLD) of the refund amount. This is a flat rate, not an annualised percentage like some of our competitors. 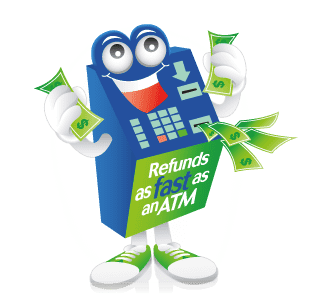 Clients can chose to wait for the ATO refund and have our fees deducted from the refund. We charge an additional $25 fee for this.